This is a first. A real-deal, holy smokes FIRST. I have a quilt on the cover! 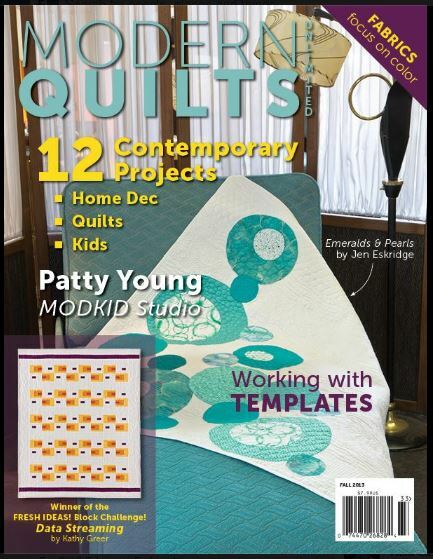 Big huge THANKS to Modern Quilts Unlimited who put my Emerald and Pearls quilt smack-dab on the Fall 2013 COVER. They just released the cover on their Facebook page yesterday. You may remember this quilt from the San Antonio Modern Quilt Guild’s 2013 Pantone Challenge. Now the pattern to make it will be available to you at the end of October when Modern Quilts Unlimited hits mailboxes and newsstands. I feel like dancing around the house!! !